Juan Trenado has a hard grasp on the ways in which migration can disrupt students’ educational and professional trajectories. His family—now comprising six sisters, three brothers and his parents—migrated to the U.S. from Mexico in 1991. As his parents’ first child born in this country, he’s seen many members of his extended family struggle with the realities of U.S. immigration laws, including deportation. “Displacement of families creates a sense of instability that affects everything,” said Trenado, a senior at UC San Diego who is studying global health and biology. Trenado’s personal experiences with the effects of migration on families motivated him to enroll in the Mexican Migration Field Research Program (MMFRP). 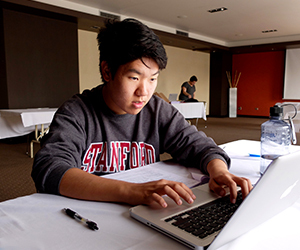 Founded in 2008 by Professor Wayne Cornelius, MMFRP provides UC San Diego undergraduate and graduate students hands-on training in migration research. As part of a yearlong sequence of three courses, past MMFRP cohorts have conducted household surveys on migration flows in rural communities in Mexico in Jalisco, Oaxaca and Mérida with support from the Center for Comparative Immigration Studies (CCIS). The 2015-16 academic year marks the first time the program is under the umbrella of the Center for U.S.-Mexican Studies (USMEX) at the UC San Diego School of Global Policy and Strategy (GPS). For the past six months Trenado and nearly 50 fellow students have carried out work in San Diego and Tijuana focused on the sizable, yet often unnoticed, population of students in the region whose education takes place in both the U.S. and Mexico. This research was made possible through a grant from the UC-Mexico Initiative Education Working Groups and continued support from GPS and CCIS. The project aims to understand how the flow of young people back and forth across the border can derail the educational trajectories of individual students who are not able to adapt to the pressures caused by migration, personally or in earlier generations of their families. An overarching goal of the research is to encourage policymakers to consider workforce development in a binational light. Data collected by surveying a representative sample of high school students will inform solutions to address shortfalls in programs and resources to support the young people who will form the binational labor force in the coming years. It also will identify opportunities created for young people who grow up straddling the border between two countries. Under the new guidance of USMEX, the underlying structure of MMFRP remains similar to years past, including the three-part course construction that allows students to learn about conducting fieldwork Mexico, go into the field to gather data and then author publications based on that data. But parts of MMFRP have shifted gears compared to previous years, based largely on USMEX’s existing connections in the binational region. Focusing the research in the cross-border region has opened up new opportunities for collaboration with El Colegio de la Frontera Norte (COLEF) and Universidad Autónoma de Baja California (UABC) on the project. Through winter quarter, MMFRP students are fielding between 6,000 and 7,000 surveys, derived from the International Study of City Youth. 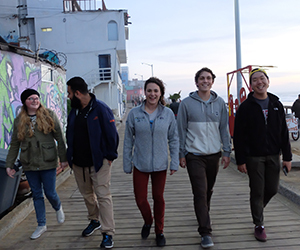 Cycling into Mexico for weeklong and daylong stints, UC San Diego students work in collaboration with COLEF and UABC students to conduct the surveys in high schools throughout Tijuana. Additional members of the research team are working simultaneously across schools throughout San Diego. The project has not been without its challenges, Trenado shared, noting surveys have to be conducted on paper in Tijuana and data must be entered manually, given a lack of funds for computers in schools. And the shear logistics of visiting a representative sample of students from across San Diego and Tijuana with a combined population of over 5 million people requires a lot of legwork—literally and figuratively. For similar MMFRP students, the biggest reward is yet to come: “Seeing the data and its impact on the binational region,” Erickson said. The MMFRP will conclude its first year of work on education and migration on May 19 in Tijuana, when students present their initial findings at UABC to participating schools and policymakers in California and Baja California. This will begin a dialogue that will continue throughout the 2016-17 academic year as the next cohort of MMFRP continues the research started this year.